Florida is a wonderfully wet world, a fluid and dynamic habitat for a dazzling variety of plants and animals – including humans – all connected to and dependent on water. From the eastern end of FGCU’s service area – Charlotte, Collier, Glades, Hendry and Lee counties – with the 730-square-mile Lake Okeechobee, to the Gulf of Mexico, Florida has hundreds of miles of rivers and creeks, thousands of square miles of wetlands, more than 1,000 square miles of estuaries and more than 100 miles of coastline. Water drives the region’s economy as locals and visitors play on the white beaches of the barrier islands, paddle kayaks and canoes on inland creeks, hike through wetlands, fish estuaries, dive and fish wrecks, ledges and artificial reefs in the Gulf. In Lee County alone, 5 million tourists a year add $3 billion to the economy, and they come for the water; one study shows that Lee County’s artificial reefs generate more than $100 million, another shows that fishing for a single species – tarpon – kicks in another $100 million. 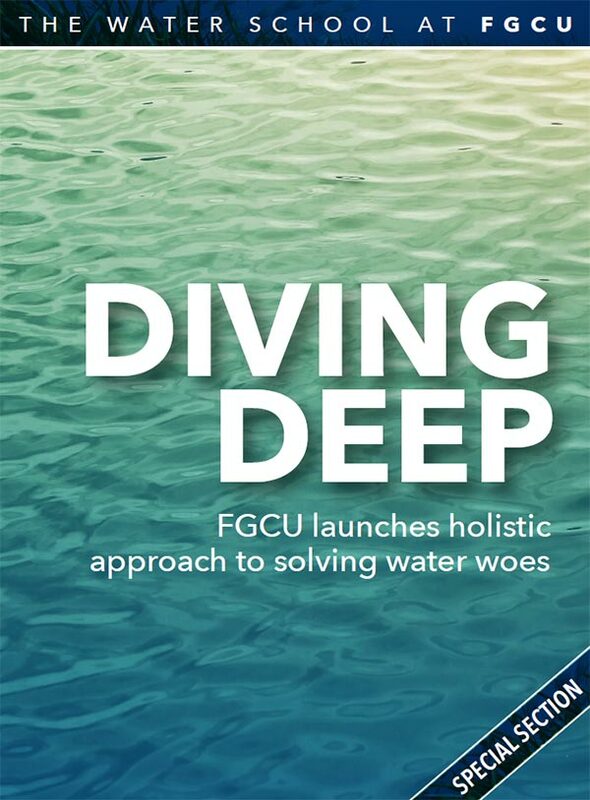 “There’s passion about water in this area,” says Greg Tolley, chairman of FGCU’s Department of Marine and Ecological Sciences and leader of The Water School at FGCU (see story page 11 in special section). “People move here for the water, for the fishing, for beaching, for birding, for boating, all those kinds of things.” But all is not well with Southwest Florida’s water; red tide in the Gulf of Mexico and estuaries, blue-green algae in the Caloosahatchee River, loss of sea grasses and oyster reefs, too much salinity during parts of the year and too little during other parts of the year, and the environmental Damoclean sword of climate change. With two decades of marine research into the region’s most important water issues, FGCU is uniquely qualified to tackle the problems that now face Southwest Florida, the state and other regions when it comes to water. For that reason, it has formed The Water School at FGCU (see story on page 11 in special section) and entered into a partnership with Mote Marine Laboratory (see page 10 in special section) to combat harmful algal blooms as well as protect this important resource. Over the past year, nutrients from agriculture and residential areas that flow into Lake Okeechobee have been released down the Caloosahatchee River, which receives even more nutrients from the rest of its watershed, and these nutrients created a toxic blue-green algal bloom that Mike Savarese, professor of marine science, picturesquely calls “Okeechobee guacamole.” The blue-green algal bloom turned water fluorescent green, killed fish, caused beach closures, and put a major hit on area tourism. Even as the blue-green algal bloom turned the Caloosahatchee to toxic guacamole, a severe red tide ravaged Southwest Florida’s coast and estuaries. Red tide is a saltwater phenomenon caused by a single-celled alga called Karenia brevis, which produces a powerful neurotoxin, known as brevetoxin. Under normal conditions, Karenia populations are 1,000 cells or fewer per liter of seawater, and no harm is done. Sometimes, however, for reasons that are not well understood, Karenia populations bloom, and concentrations can exceed 100 million cells per liter. The excess toxin in the water renders filter-feeding mollusks poisonous, kills wildlife and causes respiratory irritation in humans.